Kunsthaus Zurich, Ausstellung 100 Jahre Kino, November 1995-February 1996. Kunstmuseum Wolfsburg; Kunstshalle Wien; Brussels, Palais des Beaux-Arts; Bilbao, Solomon R. Guggenheim Museum and Porto, Museu Serralves, Andy Warhol: a factory, October 1998-April 2000, no. 178 (illustrated in color). Kochi, Museum of Art; Bunkamura Museum of Art; Umeda-Osaka, Daimaru Museum; Hiroshima City Museum of Contemporary Art; Kawamura Memorial Museum of Art; Nagoya City Art Museum and Niigata City Art Museum, Andy Warhol: From Collection of Mugrabi, February 2000-February 2001, pp. 112-113 (illustrated in color). This key question, asked of and answered by the brooding Marlon Brando in his 1953 film The Wild One, sums up much of the atmosphere not only of the Beat generation, but also of their Pop descendants. With his unconventional and deliberately popular selection of subject matter, Warhol repeatedly rocked the art world. Taking commercial products here, dollar bills there and celebrities as well, Warhol created an engaging canon of images that managed to brashly and boldly enshrine 'Low Art' symbols in 'High Art' formats. 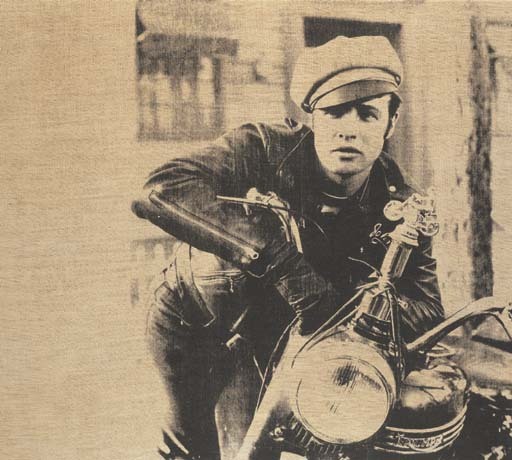 In Marlon, executed in 1966, Warhol has taken a poster image of the languorous yet menacing Brando leaning on his motorbike, an image from The Wild One. There is a raw quality in this image, with Brando at his best, manly and brooding with the accoutrements of the counter-culture, ironically outmoded even in the decade between the film and Warhol's adaptation of the image. The rough and ready, earthy quality of this image is enhanced by the rare use of the raw canvas, increasing a sense of rebellion and no-frills, removing the work from the world of painting yet paradoxically emphasising the traditional support and linking the work with high art in a way that the primed or colored canvases in other works avoid. Warhol's first use of this image was in Silver Marlon of 1963, in which, like the Elvis works, the artist used a silver background to give a sense both of ritziness and of the cinema screen. In Marlon, one of only about a half dozen images of Brando on raw canvas executed three years later, Warhol has eschewed this silver, and indeed any background color, opting for this earthier, raw canvas which removes Brando from the world of kitsch that his Elvis inhabits. Through the exposed canvas and the carefully controlled image of the manly Brando, Warhol manages to combine disparate elements in a way that manages to mock the culture of Abstract Expressionism. Both in terms of artistic process and personal interaction, Abstract Expressionism and Pop were diametrically opposed. Here, the canvas reminds the viewer of the myriad artistic acts that could have taken place on this support. However instead of the drips of a Pollock or some other abstract product of manly exertions is the controlled print image of Marlon Brando. Warhol has removed himself as much as possible from the artistic process and yet the bare canvas is an explicit reference to it. At the same time, the leather-clad trouble-maker pictured is a reminder of the culture of machismo that was so intertwined with the Abstract Expressionists, and which Warhol would later satirize. As an extension of this sense of outmoded violence, the raw canvas also reminds the viewer of sepia photographs, filling the work with a strange sense of nostalgia. The image appears as a leftover from yesteryear, as does Brando's outmoded appearance in the picture. However, by the time Warhol created Marlon, the interpretation of the various articles of clothing in the image had changed significantly. The aviator's cap and leather jacket that in the 1950s had made Brando appear as the epitome of rebellion were in Warhol's 1960s New York the fashion accessories of gay culture. Even the original movie, which came before the real explosion of the drug culture in the United States, must have appeared jaded to Warhol's eyes, despite the fact that on its release it had been considered incendiary-the film was banned for years in the United Kingdom, and many officials in the United States were terrified of copycat events. Even the violence and chaos of The Wild One must have appeared almost tame to the 1966 audience. The potency in the film of the rebel Brando's misappropriation of the aviator's hat, a symbol of heroism to the Post-War generation, is ironically retooled by its later appropriation in queer fashion. In his Warholian incarnation, Brando oozes less menace than availability. The almost palpable sense of desire with which Warhol has filled Marlon, which is accentuated by the earthiness of the raw canvas, reflects a sense of acquisitiveness which can be seen to some extent as a common background to all his works. Warhol desires Brando here, and convinces the viewer to join him in this desire. Thus Brando is transformed into an object of desire in a sense that echoes capitalism. On the one hand Warhol's use of this movie-poster image has become a work of devotion, a modern equivalent to the religious paintings of the Old Masters featuring one of the new gods, and yet at the same time the very act of taking this commercial image becomes a wry criticism of the capitalist process and of the factory era. By taking the circulated publicity picture of an actor, someone who has adopted a guise, Warhol has commented on the superficiality of the world of sales, on the importance and hollowness of appearances. The image Warhol appropriated was a commercial object in its own right, part of the same process that characterises the United States, that is embodied in Coke bottles, dollar bills, Campbell's Soup and celebrity.